With the late summer sunflowers blooming and the weather turning chilly, a warm, seductive ginger cake spiced up with rum and lime seemed just the thing. Then blow me down but the next day #GBBO comes on and the first challenge is exactly what I had made the day before! Must admit mine didn’t look quite as impressive as Rahul and co.’s though: I kept it simple and left it undecorated, so no icing and unfortunately no miniature gingerbread house! (wasn’t that stunning! Kim-Joy’s Pear and Ginger Cake ). I’m not sure what Paul and Prue would have said about it, hopefully not that it was “claggy” (still trying to work out what that means! Underbaked maybe? If anyone knows, do let me know) Fortunately, I had less judgemental people eating it and it apparently went down very well after a hard day’s volunteering. And no, I did not then go on to make maamouls and a biscuit chandelier! What kind of person wants their biscuits hanging up in the air? Answers on a postcard please! For those of you who don’t know what I am talking about it’s Spice Week Series 2 Episode 5 of The Great British Bake Off on Channel 4. Put the sugar, treacle, syrup and butter into a saucepan and heat gently, until the sugar dissolves. Then take off the heat and stir in the rum, marmalade, stem ginger and the spices. Heat the oven to 160C fan. Line a 22cm round baking tin with parchment. Mix in the flour and then the egg. Pour into the baking tin and bake for 35-45 minutes. It’s worth checking it to make sure it doesn’t overbake and go dry. Yes, definitely. I have made it before substituting the lime marmalade for orange marmalade and the rum for whisky and it is equally as good. 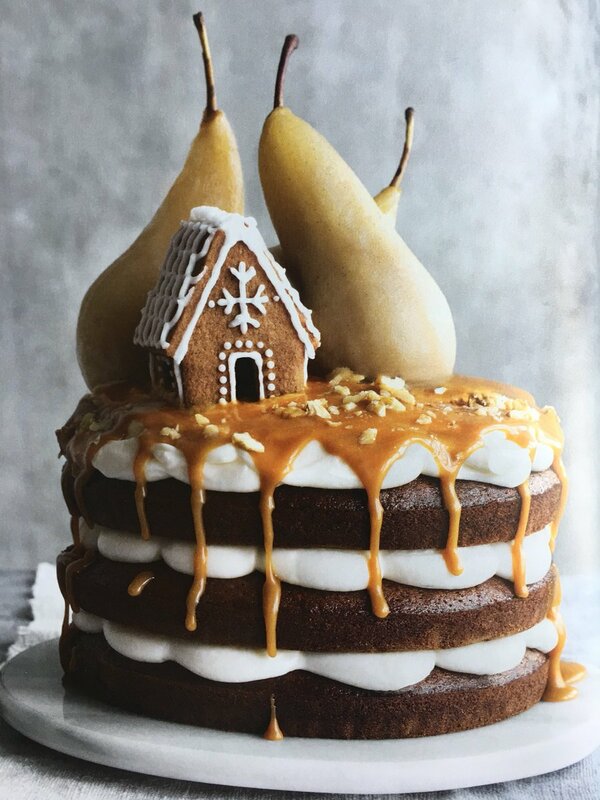 I am looking forward to finding out some of the recipes used by the Great British Bake Off contestants though, including Kim-Joy’s wonderful pear and gingerbread cake, which is apparently going to be in the next GBBO recipe book. This looks and sounds delicious. I’m a big fan of rum and sliced cakes in general so I’ll definitely be giving this a try. Pinned for later. Thank you, Kim. I’d really love to know how it turns out.